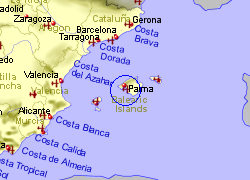 Golf Santa Ponsa is in a large urbanised area having 3 golf courses (Golf Santa Ponsa I, II and III) together with 6 Km of coastline and 2 ports, located in south west Mallorca, 15 Km from Palma. Golf Santa Ponsa I was designed by Folco Nardi, has 18 holes, is par 72, and has been the venue for a number of championships. Golf Santa Ponsa II is also an 18 hole par 72 course and hosts important matches, while Golf Sant Ponsa III is a nine hole par 30 course. There is also a 4 star hotel (situated on course I), and a yacht club. The course has 45 holes. 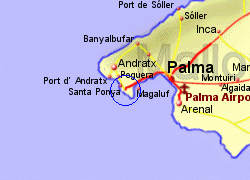 Real Golf Bendinat 18 holes, 6Km south west of Palma centre. 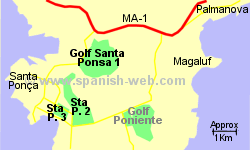 Map of the Golf Santa Ponsa area.